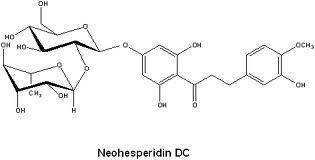 Neohesperidin dihydrochalcone (Neohesperidine DC or NHDC) is a low-calorie sweetener and flavour modifier which may be produced by hydrogenation of neohesperidine, a flavonoid occurring naturally in bitter oranges. 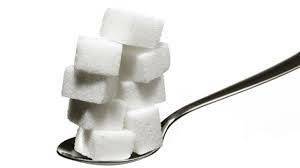 NHDC is 1500-1800 times sweeter than sucrose at threshold levels. At practical use levels, it is about 400-600 times as sweet as sucrose.NHDC is not present in nature, but structurally related flavonoids and their corresponding dihydrochalcones occur naturally in many plants, e.g. 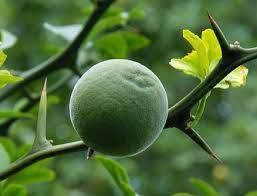 citrus fruits. The sugar component of NHDC is a disaccharide b-neohesperidose. NHDC is freely soluble in hot water and very slightly soluble in cold water. Ingested neohesperidin DC is not absorbed to a significant extent. It is metabolized by gut flora, yielding the same or similar breakdown products as its naturally occurring analogues. 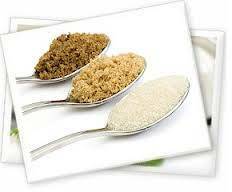 NHDC is typically used in combination with other sweeteners. In such mixtures,it exhibits remarkable synergistic effects and can enhance the quality of sweetener blends.Even at very low concentrations, NHDC can improve the overall flavour profile and mouthfeel of foods. Under such conditions, NHDC acts as a flavour enhancer and modifier rather than as a sweetener. As a flavour enhancer, NHDC is used in a wide range of products and is indicated by the E number E 959. NHDC also has bitternessreducing properties. NHDC is stable in solid form and in aqueous solutions of pH 1-7 (t½ > 1 year,20° C). It is heat stable and can therefore be used in foods requiring pasteurization or UHT processes. NHDC does not promote tooth decay and may be used in products for diabetics. -Used in naturally bitter products. Pharmaceutical companies are fond of the product as a means of reducing the bitterness of pharmacological drugs in tablet form. -Used for livestock feed as a means of reducing feeding time. The safety of NHDC was confirmed in 1988 by the Scientific Committee on Food (SCF) of the European Commission – now the European Food Safety Authority (EFSA). NHDC is an authorised sweetener in the European Parliament and CouncilDirective 94/35/EC of 30 June 1994 on sweeteners for use in foodstuffs as well as an authorised flavour enhancer in certain applications under the European Parliament and Council Directive 95/2/EC on additives other than colours and sweeteners (the so-called Miscellaneous Additives Directive). The functionality of NHDC as a flavour modifier at low concentrations has steadily gained recognition. Approvals as a flavour or flavour ingredient exists in countries such as theUnited States,Japan,Australia and New Zealand, and further approval is being sought elsewhere.